While I am an avid fan of most types of Asian cuisine, I have always been rather underwhelmed by bok choy. Perhaps it’s the similarity in color and texture to celery, another vegetable I dislike; perhaps it’s that I can’t help but note how its bulbous bottom and fan-leaf top bears an eery resemblance to the comic strip Dilbert‘s eponymous character; either way, bok choy has always seemed more trouble to me than it’s worth. Besides a bit of a crunch, really, what does it offer? An insipid, watery base and limp, lackluster leaves. Bleh. Last weekend, however, I found myself with three of those babies (and I mean that literally: they were baby bok choy) courtesy of our weekly organic produce box, and wondering what the heck to do with them. Now, it’s true, a weekly delivery of assorted organic produce is normally a good thing. For one, you get to eat assorted organic produce (and weekly!). I love the fact that I can reduce my time in the grocery store, as the organic bag is delivered right to our door each Friday. All I need do is haul it inside, allow The Girls to sniff their approval of its contents (“We really appreciate that, Mum!“), then unload it onto the kitchen counter where, before depositing them in the appropriate storage bins, I might admire the brilliant carmine of this week’s pomegranate, say, the stiff, tan sheaths protecting hardy yellow onions, or the crisp, shiny trio of red and gold-flecked Gala apples I received. For me, one of the great pleasures of having the service is how it often introduces as-yet untried wonders from the world’s vast array of fruits and vegetables, such as persimmon (loved it) or fiddleheads (not so much). What’s not so great, however, is that we sometimes receive items that are never eaten. Considering that the HH is willing to try pretty much any (cooked) body part from a dead cow, he’s woefully unadventurous when it comes to the vegetable kingdom. Offer him some parsnips, and he crinkles his nose in disgust (though he did like them disguised as oven-baked french fries–give it a try! 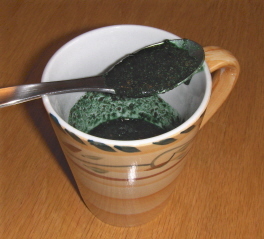 ); dish up some scrambled tofu and he shakes his head forcefully; suggest even a sprinkling of spirulina, and he clamps his mouth shut like a toddler faced with cough syrup. He wouldn’t even take one bite of my breakfast Apple-Quinoa Cake the other week (though he did seem to enjoy the baked Tagine). This leaves me alone to consume all the produce the HH has spurned. Sometimes, I just can’t eat it all before it begins to, shall we say, “mature.” Of course, the most sensible way to deal with the undesirable fruits or veggies would be to take advantage of the company’s generous substitution policy: you can replace up to two items with those of your own choosing, as long as you contact them before your delivery date. Unfortunately, as I may have mentioned before, my organizational skills ain’t what they used to be, so I (too often) tend to forget. And end up with feeble, neglected veggies. Well, this was one of those weeks. I forgot to replace the dreaded bok choy, and it was rapidly approaching decrepitude in the bowels of the crisper drawer. Given what’s going on in the world of food these days, I simply couldn’t bring myself throw it away. But I wasn’t looking forward to yet another mediocre stir-fry, brimming with pallid bok choy and other dreary veggies in the wok, either. Then I remembered Heidi’s recipe for caramelized tofu. About a month ago, I had a little love-in with the sweet, crispy cubes enhanced by bits of browned, crackly, caramelized garlic and toasted pecans. At the same time, I’ve always been intrigued by what’s called “crispy spinach” in some of the Chinese restaurants I’ve patronized. I decided to combine the best of both dishes, while avoiding anything deep-fried. The HH adored this as a side dish and inhaled two servings. I was rather enamoured myself, as I finished up what was left. Would I make this again? Most definitely. In fact, I may even need to order it specially with next week’s produce delivery–that is, if I can remember to get the order in on time. With all the great antioxidants found in all cruciferous veggies plus the many immune-enhancing allium compounds in garlic, I thought this recipe would be a great submission to Chris’s Cooking to Combat Cancer event, over at her blog, Mele Cotte. I don’t have much experience with bok choy; but now that so many bloggers are posting about it, I think I need to give it a try! I have had the same feelings about bok choy as you… so I’m so excited that you posted this recipe! My husband loves it so he will be thanking you I’m sure. That looks so good! I’ve been having a mad craving for bok choy lately, but I have never cooked it. Looks great! Several of my co-workers and I have been developing gardens for this year. One of them told me she no longer feels bad if a bit of produce goes off, because she just puts it in the compost pile and works it into her gardening! I can’t stand celery either! Ick! That bok choy sounds really good. That picture has me drooling. I am impressed that you have managed to tempt me with bok choy! I never buy it as it just doesn’t interest me but this looks great! Something must be in the air, because I had bok choy today too. 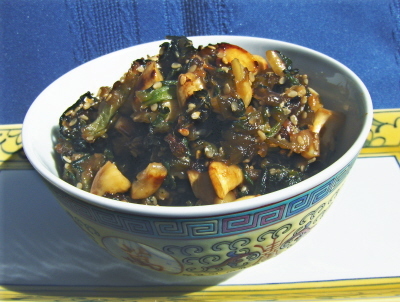 Mine was just plain ole stir-fried bok choy though; yours sounds much more appetizing! I cooked bok choy tonight, too, and had it with soba. I actually like it. If I’d read your post first, I would have tossed in some sucanot and crisped it a little. 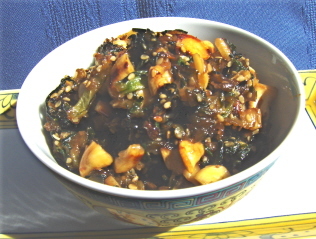 Instead, I added prunes – still thinking of your quinoa dish, which I haven’t gotten around to trying yet. Underwhelmed…that exactly how I normally feel about bok choy. But this looks great! I’ll definitely give it a try. I wasn’t a big baby bok choy fan either, until now. This recipe sounds fantastic! I haven’t seen that many recipes for it. . .must go take a look! I do think it’s worth a try to see if you like it or not. Well, if your husband already likes it, then he’ll probably love this version . . .it made a (sort of) fan out of me! Thanks so much for your comment! I loved the idea of your event. . . hope you give this a try! I’m with you. Don’t know if I’d buy it deliberately, but I did really enjoy this version! Yes, bok choy seems to be making the rounds! I’d be willing to try yours in a stir-fry, though 🙂 . Funny how so many of us have had it lately! The prunes sound like an interesting addition, too. (Oh and let me know if you try out the tagine!). I’d guess you’d like it this way, despite your usual feelings for it. . . garlic and caramelized–what could be bad? mmm… that sounds heavenly! i didn’t know we can caramelize bok choy! I love bok choy–I am glad you found a way that you enjoy it too! See…never give up! I love getting the CSA box too…it is like a challenge every week to use the produce up in fun creative recipes–a challenge I am always up for! I think you would enjoy the really tiny baby bok choy, the kind that’s the size of a teaspoon. No chopping necessary, so it would be perfect for your caramelized recipe. It looks delicious. I have a brother that reminds me of your HH. He will eat any part of a cow or pig but would rather starve than try a new vegetable. I LOVE bok choy. I don’t generally do much to it because I can easily enjoy it plain steamed, but this recipe looks perfect for if I ever want to make it the star of a meal. How lucky you are that you get a weekly organic produce box! I have yet to cook with bok choy, but after reading this post I may have to give it a try!